Today we released gFtp 2.0.19 for Mac OS X gFtp has been fully ported to GTK 2 and will run on OSX 10.11 or higher. You can find it listed in the Putty for Mac category. Linux fans will already be familiar with the world of GNOME and gFtp but we have brought it to a wider audience by providing gFTP on Mac OSX. gFTP is a multithreaded File Transfer Protocol client program. It is most used on Unix-like systems, such as Linux, Mac OS X and Sony PlayStation 3. It includes both a graphical user interface (GUI), which utilizes the GTK+ graphical toolkit, and a command-line interface. gFTP has been translated into over 45 different languages. There is support for the FTP, FTPS (control connection only), HTTP, HTTPS, SFTP and FSP protocols, as well as FTP and HTTP proxy server support and FXP file transfers (transferring files between two remote servers via FTP). The GUI uses a double-paned layout, with the local filesystem in the left pane and the remote filesystem in the right pane. Below there is a transfer queue that shows the real-time status of each queued or active file transfer. 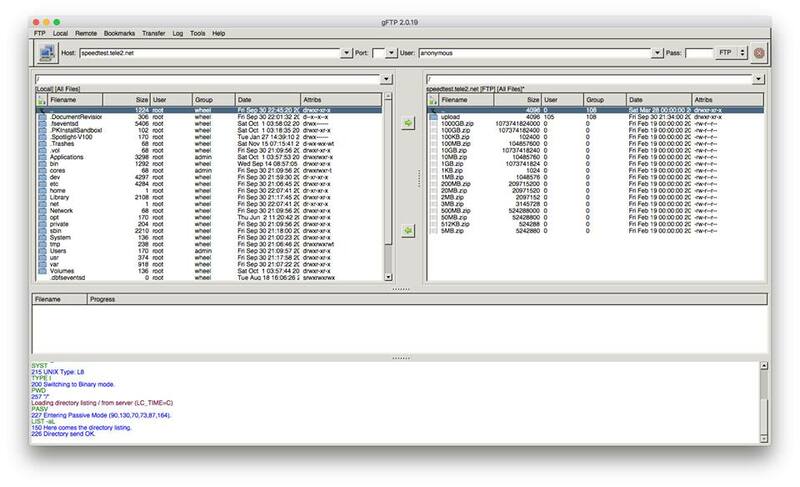 At the bottom is a message log, which displays the text commands and responses between gFTP and the remote server. Sites are stored in a hierarchical collection of bookmarks, though a site bar allows connections to unbookmarked sites. Wine Reviews online store is here.